13. 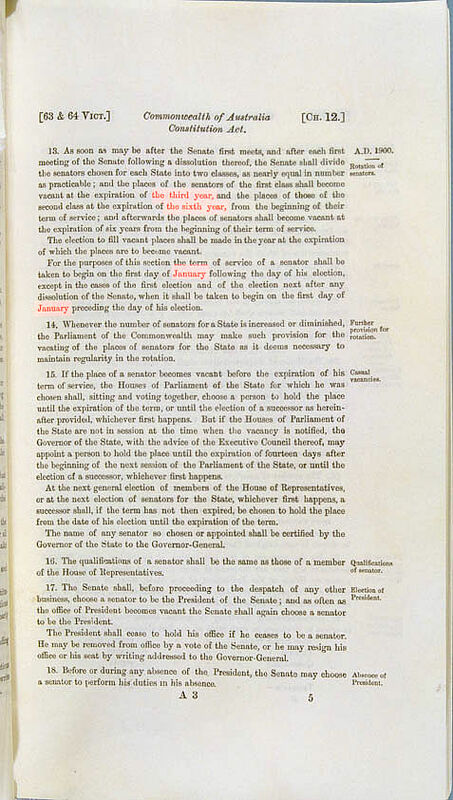 As soon as may be after the Senate first meets, and after each first meeting of the Senate following a dissolution thereof, the Senate shall divide the senators chosen for each State into two classes, as nearly equal in number as practicable; and the places of the senators of the first class shall become vacant at the expiration of the third year three years, and the places of those of the second class at the expiration of the sixth year six years, from the beginning of their term of service; and afterwards the places of senators shall become vacant at the expiration of six years from the beginning of their term of service. The minor changes to the wording of Section 13 adjust the timing of Senate elections and the date on which Senators commence their terms of office.